This is an experiment. I’ve read loads of blogs, but never published one before. It shall be interesting to see how it unfolds and develops. I guess I will mostly write about pens, the joy of writing, post a photo or two, and some reflections on life and the world. I’ll try to be non-pretentious. Another educated guess is that I might try to promote my cold corner of the world – Scandinavia. In June – at latitude 60 – the sun is only gone for about 5-6 hours every day. Even after dusk (around 11 pm) the sky never gets completely dark – it is like the sun is just off for a little nap. In December the broad daylight is here for 5-6 hours (less when it is cloudy). But the white nights in the summer is almost worth this darkness. Especially the first afternoon/evening – usually in the beginning of March – when one suddenly feels that the Spring is here – the light is here – is almost undescribable. A intensive mixture of longing, hope and eternity. A wild, passionate yearning and belief that everything is possible. So, no. Even if it is dark now (well, it is well past midnight here as well) I wouldn’t want to be without that feeling. I wouldn’t. The pale, blue eternal light. 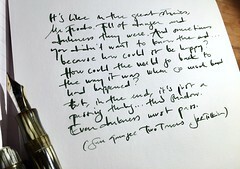 There is actually an ink that resembles this light and writing with it now reminds me of spring; Diamine Royal Blue. A clean blue – like the evening sky when the spring is here.I’ll post photos of it later. But that is far away now. For now it is quite comforting listening to the rain pattering on the windows. Goodnight. This entry was posted in autumn, scandinavia, seasons, writing and tagged diamine, fountain pens, ink, life, scandinavia, seasons, writing. Bookmark the permalink.